In my previous post on the Lower East Side, I called Little Italy’s current status as an independent area questionable (I had earlier entered “laughable” but thought twice about it, and now I’m thinking of it a third time). That sentiment isn’t original to me. If you saw one of the very last episodes of “The Sopranos”, there was a little in-joke where two of the characters are walking through Little Italy plotting evil deeds and all of a sudden…they’re in Chinatown. They do a bit of a double-take and the scene cuts away. It’s sad, but Little Italy is almost gone. Yeah, it’s there, but only in spirit. For the couple of years I’ve been wandering through Little Italy, it’s been relegated to Mulberry Street only with parts of a couple of side streets. 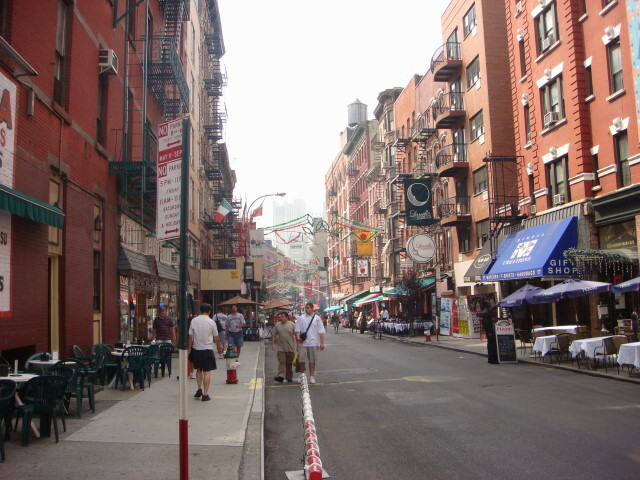 Famous Little Italy streets such as Elizabeth and Mott…all are parts of Chinatown now. Even Mulberry Street’s claim to Little Italy status is truncated. Below Canal, pure Chinatown. Above Broome, mostly non-Little Italy. There’s just a couple of blocks left, but even they are no longer “pure” Little Italy. I haven’t seen a Chinese restaurant open yet, but it’ll come. But is it bad? Nah. The neighborhood is evolving and the Italians have moved on to greener pastures. 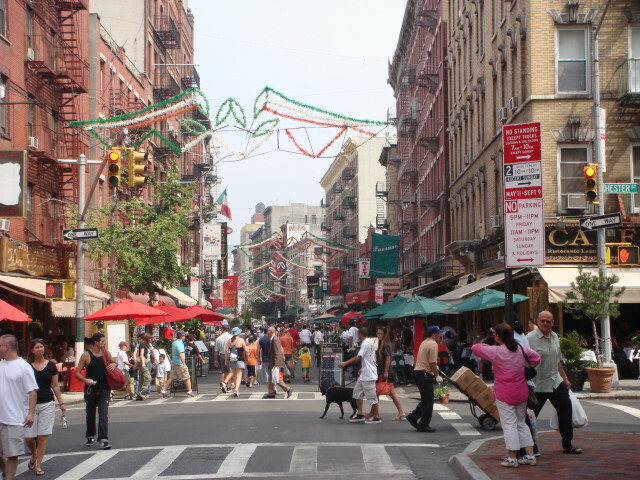 Little Italy will continue for a while simply because it’s a pure tourist attraction. But I don’t think the Italian heart remains…except perhaps within the church near Canal. Saturday on Mulberry Street. Notice the decorations in the distance. It’s the annual Little Italy Festival. Not to be confused with the Feast of San Gennaro (now, that’s a spectacle in and of itself despite the vanishing of Little Italy). This festival is muted and pleasant. It does the traditional blocking-of-the-streets-to-all-traffic. 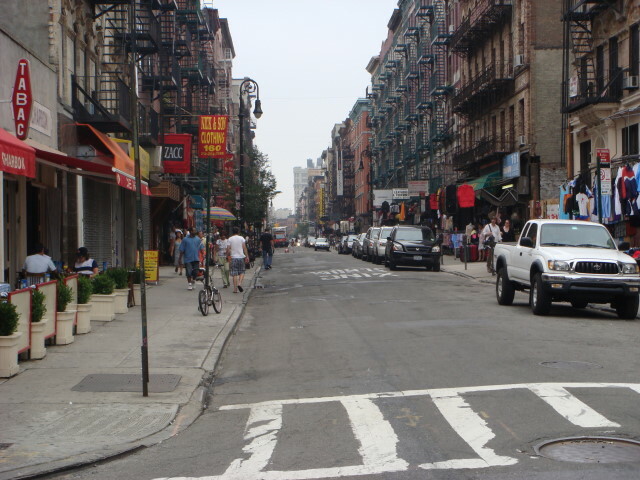 I think most residents of streets in that part of Manhattan would love to close off their streets, but only Little Italy seems to get it done on a regular basis. 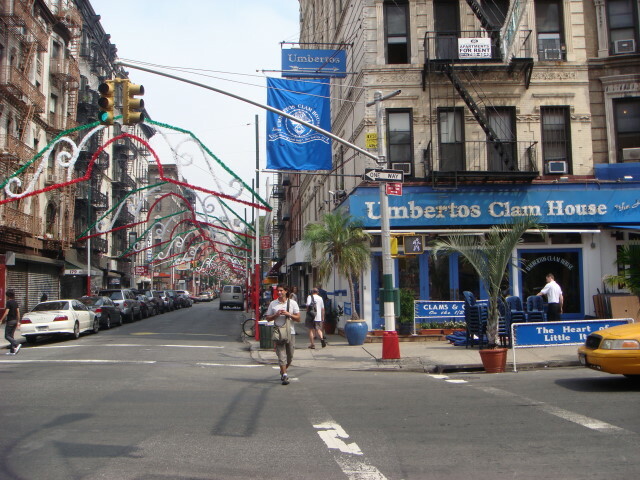 And a nice historic little place: Umbertos Clam House. It calls itself the “Heart of Little Italy” and that’s not a problem for me. But I tend to remember it for the biggest even associated with the murder of Crazy Joey Gallo in 1972 while he was there for a party. I recommend Jimmy Breslin’s book “The Gang that Couldn’t Shoot Straight” for a humorous roman a clef about Joey Gallo. But the real Crazy Joey was a murderous thug who may have been actual killer of Albert Anatasia and behind the shooting of Joe Columbo. And who know how many others. And now the interesting part. Google maps still says that Umbertos is at Mulberry and Hestor. That ain’t true at all! It’s up on Broome. Apparently, after the murder of Crazy Joey, the restaurant was moved to escape the notoriety. But Famous Ankles remembers…and apparently so does Google. And finally, the last really authentic part of Little Italy: the Church of the Most Precious Blood. It’s apparently run by the Franciscans. I don’t know if there’s an actual monestary associated with it, but maybe. My best memory of the church is during last year’s Feast of San Gennaro (held each September so I’m going back soon!). The streets get incredibly jammed with people and restaurants spilling out onto the street and pushcarts everywhere and the like. You look at it and see a lot of money changing hands (good old fashioned capitalism). 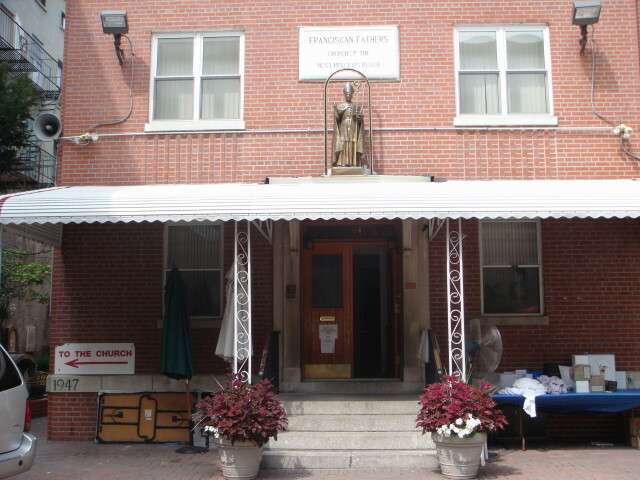 When I got to the church, I saw a statue of San Gennaro next to a board with money tacked onto it (sort of like “The Godfather Part 2” and the statue going down the street, but this time the money was simply tacked to a board). There must have been…$50 or $60, max. The Church sponsors the feast, but doesn’t seem to get to partake in the commerce surrounding it (they try with some trinkets, but I didn’t see many borrowers). I’m hopeful they got recompensed somehow and were able to use the money to good ends. It sure doesn’t look like they spend it on luxurious digs. Stay tuned for an update from the Feast of San Gennaro. 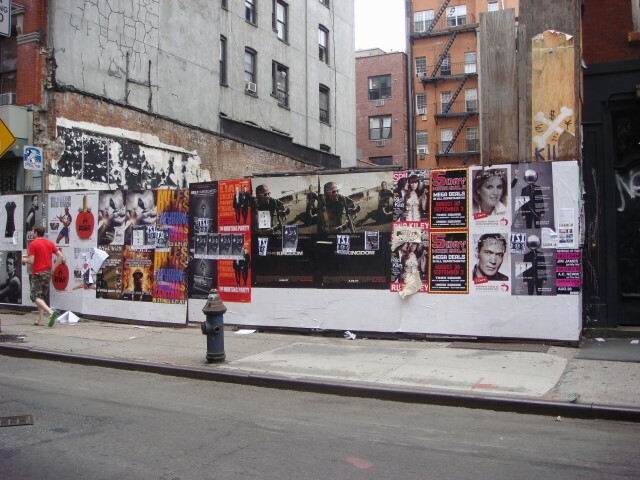 As good/wonderous/cool/interesting/artistic/gritty that the Lower East Side’s Rivington Street and Ludlow Street are; in my book, the real street in LES is Orchard Street. Ya wanna see Orchard St? Go a bit further south than the Rivington St and Ludlow St area and cross Delancey St. Physically and interesting-wise, Orchard actually parallels Ludlow St., but below Delancey, there’s no contest. 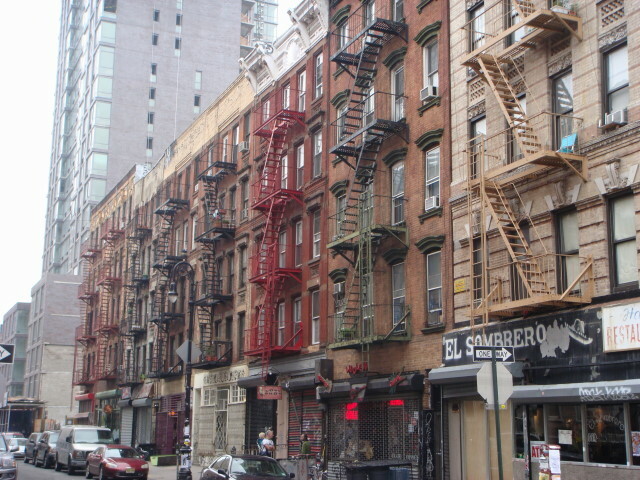 First, Orchard St. has the historical Tenement Museum, which I would encourage you to visit if you have the chance. My favorite part of that was when I looked at one of the places they’ve restored to it “tenement” condition and saw how closely it resembles my own place (before I had it completely renovated). 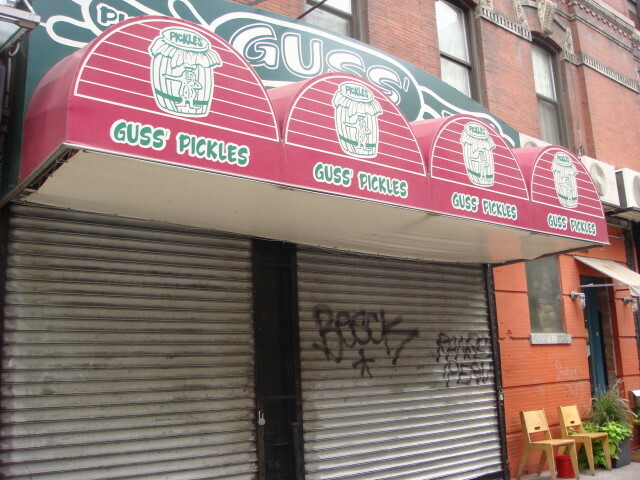 But the real reason is the greatest, most wonderous, most awe-inspiring place for many a block around: Guss Pickles. Sad to say, they are closed on Saturdays. The pickles are unbelievably good (get the spicy! Get the Spicy!! GET THE SPICY!!!!). They sell them singly or by the small bucket. Note: this is not the place you’ll find if you google Guss Pickles. I’m told there are legal proceedings over the name and that this one on Orchard Street is the original. UPDATE (9/8/2007): I talked with Pat Fairhurst, owner of Guss Pickles on Orchard Street and she said the proceedings are resolved. The other Guss Pickles has obtained the trademark, but the Orchard Street Guss Pickles can keep the name. She re-iterated that they are the last of the “old-time pickle makers” in the LES, established in 1920 by Izzy Guss). If you get there, you’ll discover that the storefront is a sham. You wanna buy pickles: they roll the barrels out into the street every day and you buy them there. GET THE SPICY!!!!!!!!!!!! I once took a bucket to work and some people complained that they smelled up the place. They still grabbed three or four pickles each, but that was beside the point. After Leona Helmsley died, I did a post and mentioned that at least her will wouldn’t be contested with the same vigor and rancor that Brooke Astor’s appears to be gearing up to. I may be wrong. Very, very wrong. If you haven’t heard, Leona left $12 million to her dog, zillions to her charitable trust, and zip for a couple of grandkids. I’m betting on the dog. It’s been known to bite. Too long without a Harlem post? Looking through some of my old pictures, I spotted one that I can’t believe I didn’t include. Hey, in this case it gets its own post. 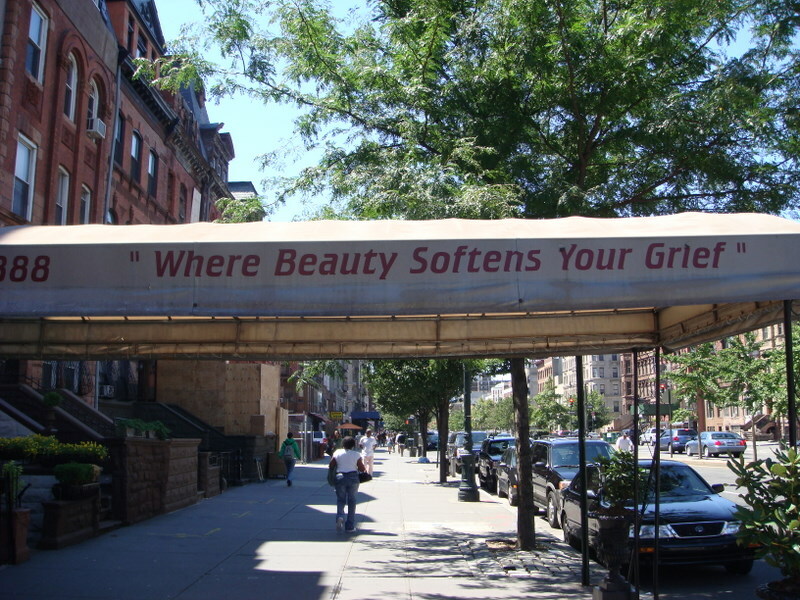 In my second visit to Harlem, I was just wandering around Lenox Avenue and spotted an awning with the world’s strangest slogan. “Where beauty softens your grief.” The first time I saw it, I was stunned at the temerity of a place that would invite people in to prepare them to look their best at a funeral. I thought it was a beauty parlor catering to the mourners. Instead, it’s a beauty parlor catering to the dead. Well, not quite just a beauty parlor. Yes, folks. It’s for a funeral home. Actually, Owens Funeral Home at 121st and Lenox Ave. I’m told it’s Harlem’s busiest. Apparently they specialize in…putting the best face on a tragedy. It’s just too weird. You can google them and get some extra weirdness. There are actually books put out showing their handiwork. Just too weird. The Lower East Side is an old staple of mine. I started visiting it well over a year ago and, until I started ankling my way around Harlem, I considered it the coolest part of Manhattan. Despite Harlem’s cool status (and my somewhat dampened love of that place), LES is still cool. It is also so all-over-the-place that it merits many posts over the future. This post is just a quick jaunt to some old favorites that I’ve written about in my e-mails to friends and family. Now, I get to add pictures. Okay, LES (I don’t pronounce it as anything other than “Lower East Side”, but I don’t like to type that much) is known really for its historical position as the first stopping point for immigrants. It still is, but not really. Well, yeah; but not even close. You see, it’s coolness makes it really expensive, but the edges are being filled in by Chinatown which has….no really evident coolness….but lots and lots of new immigrants. The whole point of the original LES was density. It boasted the highest population density in the world during the great immigrations of the 19th and early 20th centuries. And that’s with a relatively low-rise buildings. They seem to usually reach maybe 3 to 8 stories. Graffiti, noise, noisomeness, and still people are storming the ramparts to get a place in LES. You see, LES is gritty and interesting and maybe a little bit wild; and each of those attributes is like catnip to the hipsters. Well, LES may be “gritty” if you define gritty as dirty and graffiti-covered. But, it is very interesting and has a strong connection with the arts. I’m not really sure about “wild”, though. I only bring it up because of a character I ran into some time ago who pointed out a place that I’ll save for another post in the future. In any case, I really like LES and I think anyone who visits will leave with affection. It’s just one of those kinds of places. Anyway, I took the bus down to Houston Street and wandered over into LES. I always think of three streets when I’m in LES: Rivington, Orchard, and Ludlow. Rivington goes east-west and the other two are north-south. All of them are considered “cool”. When I first started to visit LES, I spoke with a co-worker about Ludlow being “cool” and that I hadn’t known its reputation. 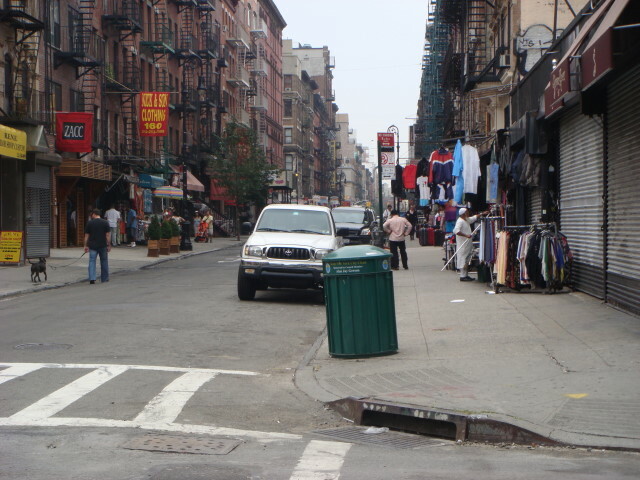 He laughed and replied: “if you had a 15-year-old daughter, you’d have known.” Here’s Ludlow Street on a Saturday morning. And the architecture can be wonderful. But, the gritty, artistic side still shines out. There are places all over Manhattan that do stuff like this, but I find it more “natural” in LES. Of course, they absolutely, positively must be ragged and torn and (most importantly) duplicated. But, then, there’s Rivington. 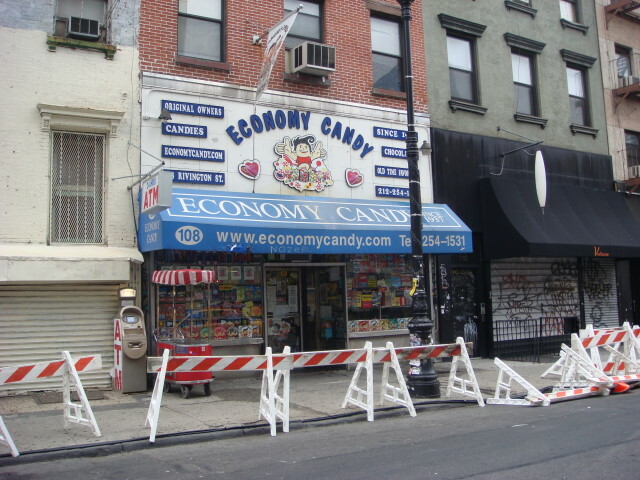 Rivington has two places of note, at least for Famous Ankles: Economy Candy and TeaNY. 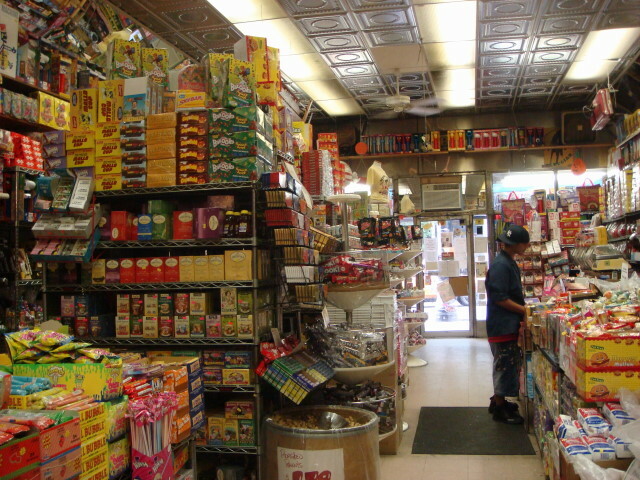 Economy Candy is simply a big candy store. In truth, a WalMart might physically have more candy, but Economy Candy knows that displaying candy from floor to ceiling is an absolute must. In terms of “art”, Economy Candy is art. TeaNY is a wonderful, but very small tea restaurant partially owned by musician Moby. Usually, it’s jammed and I can’t get in. However, there are lots and lots of different teas and I can attest to how good it is from experience. Not cheap, but not outrageous. I’m saving Orchard Street for another post. As usual, I went to my Episcopal church on Sunday. We had 16 attendees. Yowza! 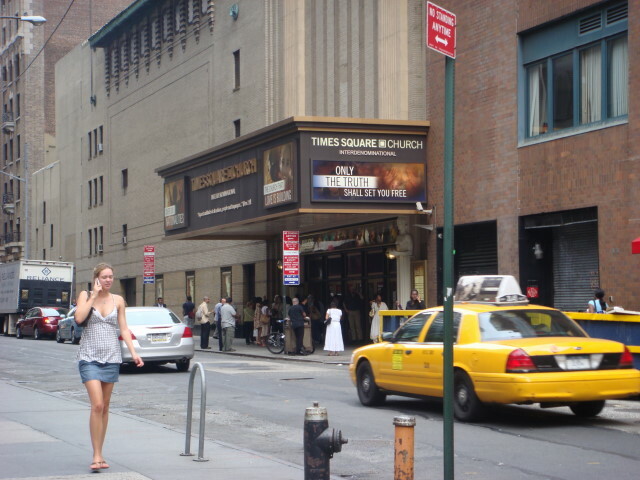 However, I’ve been noticing that my site still gets some hits from people going to my Times Square Church post and thought I’d drop by there after today’s Episcopal service to get a picture or two with my new camera. 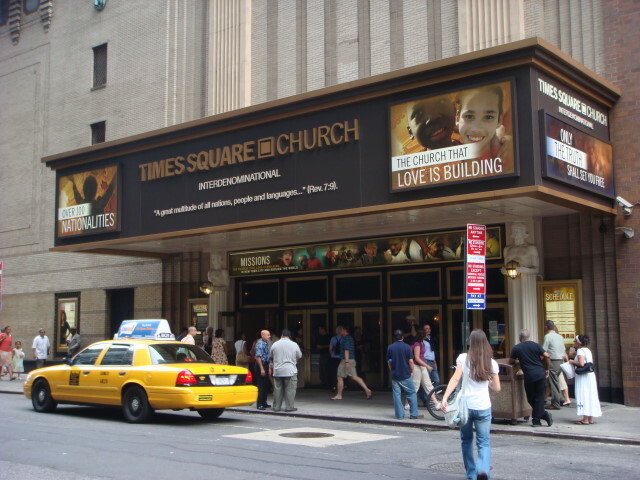 On the left, right above the McDonalds, is part of what is called the Times Square Church Annex. I never went in there during my previous attendance, preferring either the actual church area or the downstairs area. Here’s a couple of pictures of the front of the church. Three comments: 1) there more people at the entrance there than attended my church. Good for them! ; 2) You can start to see some of the diversity of the attendees. I’ve never attended a Church with such a wide ranging group. This is NYC, of course, but it still goes beyond that; 3) Usually, I’ve seen a lot of homeless around the front. They seem to be missing today. I didn’t go inside (no way would I get a seat inside the service area, I don’t know what else to call it…sanctuary, pews, none really seems to work) because I felt like a jerk taking their pictures from across the street. Today was the celebration of Pakistan’s 60th year of independence. Technically, the anniversary was Tuesday, August 14, so you may have had your own celebrations earlier. 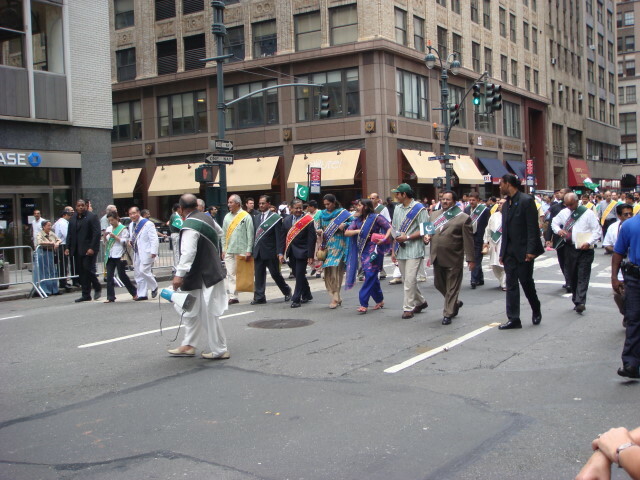 As part of today’s celebration, there was a NYC parade and Famous Ankles, a known habitue of such parades, couldn’t have been kept away with a stick. Okay, maybe if it were a big stick, but then I would have missed an enjoyable time. 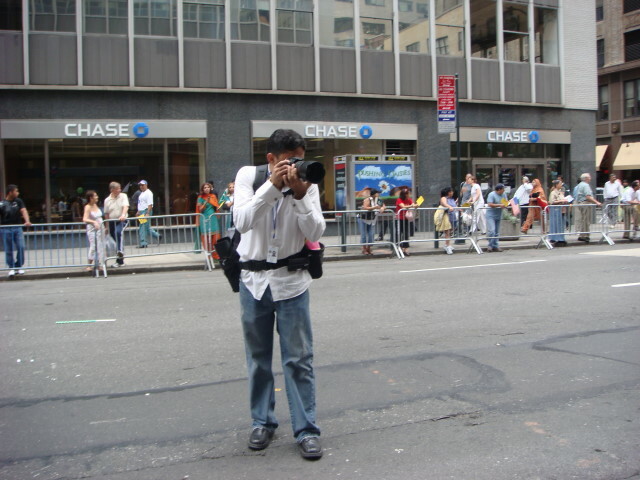 The parade was held on Madison Avenue between 41st Street and 27th (the parades on Madison Ave. typically go north to south). My home and office are in the general area so it was a very easy commute to the site. What did I expect from the parade? My favorite parades are always the small ones and the biggest point is to see things other than the parade itself. My “Famous Ankles” name comes from the Greek Independence Day parade in which my ankles became relatively famous by being next to two adorable little girls who received more pictures taken of them by official parade photographers (and people on the floats with cameras) than I could count. As odd as it may seem for a Christian, my two favorite parades of all time are related to Moslem issues/countries. 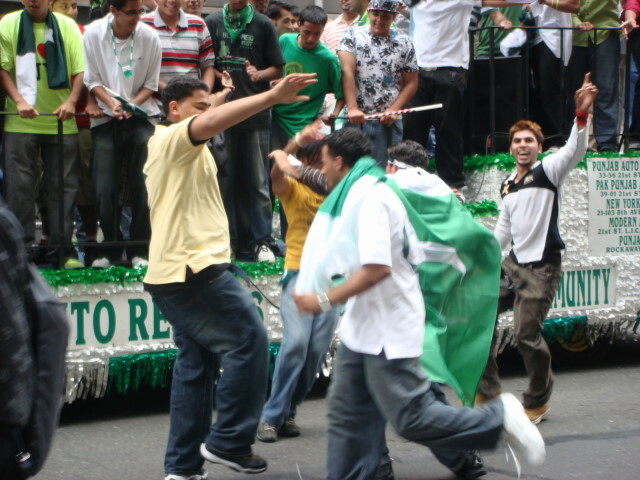 First, the Shiite parade last year on Park Avenue was amazing for the intensity, friendliness, and neighborliness of the participants (several people in the march came to me, the most northern European of all spectators, to let me know what the parade was about, what everything symbolized, the history of the issues, and everything). Second, the Persian Day parade from earlier this year had me interviewed by a Persian film crew who were thunderstruck that I knew why the parade was going in (they celebrate their New Year at the vernal equinox) and that I was delighted to see the incredible panoply of Persian culture including dancing girls and Zoroasterians. 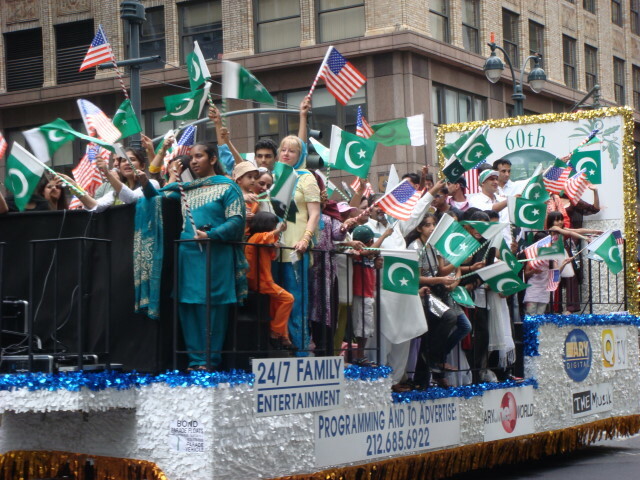 So, to make a long story short: I was looking forward to the Pakistan Independence Day parade and it didn’t let me down. It was a small item that captivated me, but it was one that I enjoyed thoroughly and hope to be able to relate. I showed up about 20 minutes before the start of the parade. 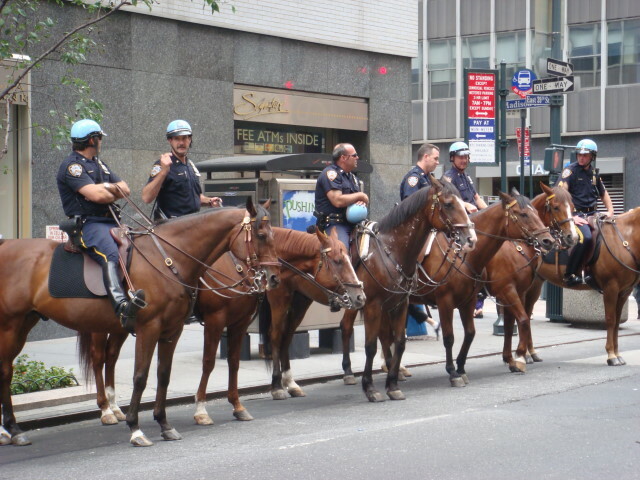 I was near the beginning of the parade so I did run into the NYC parade starting group: cops and horses. 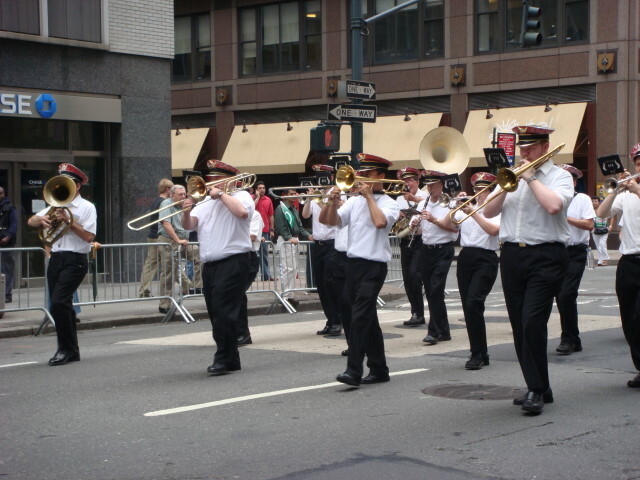 The first marching group…wasn’t quite Pakistani…it was a marching band…playing Sousa! Okay, that’s not astonishing. Even now, Sousa has a place at most parades. 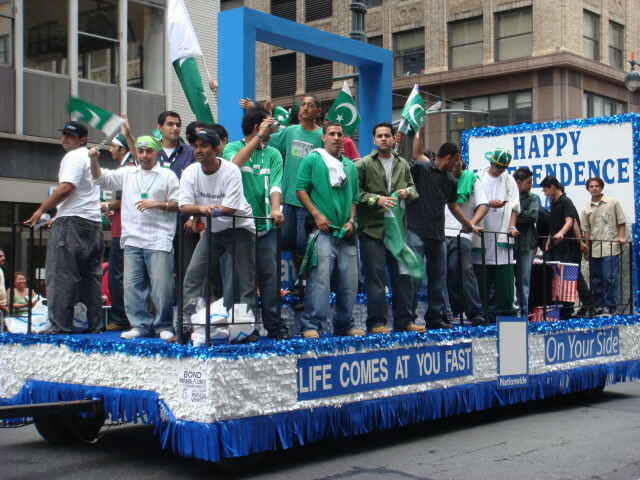 And to get technical, this really wasn’t a Moslem parade. It was a nationalist parade. Sousa’s good for that: nice marching music. The next group was a group of police officers, apparently of Pakistani origin. My picture didn’t come out. Sorry, NYPD. And then the dignitaries. I did get a number of pictures, but I haven’t the foggiest as to who these people were. There is one item about the dignitaries that I don’t understand. Who are the Black guys on each end? They don’t look of an age that would lend themselves to being long-time supporters and friends of the Pakistani community. They carried themselves more like bodyguards or something. But that makes even less sense. Another dignitary issue: I’ve been to oodles of these parades. Congressman Anthony Weiner is always a member of the nationality (at least for the day). I know who he is because he loves to have people standing right behind him with a sign saying “Congressman Anthony Weiner”, just to make sure people know. Maybe they wouldn’t give him a bullhorn today (and he does love a good bullhorn). The mayor loves to come to these things. No show today. Both NY senators (Schumer and Clinton) come to them. No show today. It’s enough to make you feel for the Pakistanis. To be snubbed by Weiner… Of course, the obvious answer for all of the politicians is that they may not want to be associated with a country that is so Moslem and run under a military dictatorship. But I would tend to say that today’s crowd would have been receptive to a democratic and tolerant message. 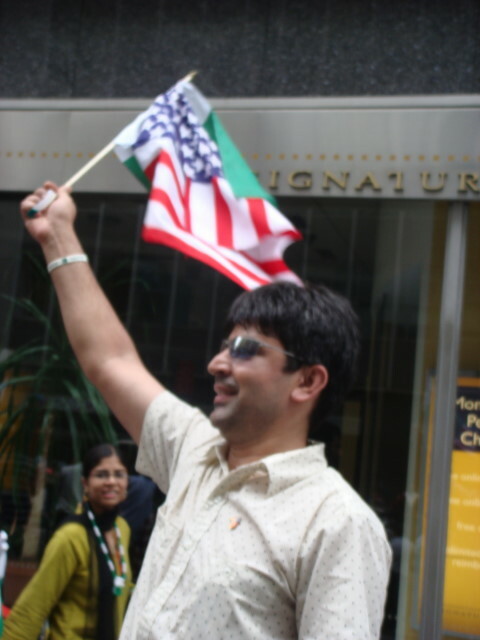 Hey, there were a lot of American flags being waved in addition to the Pakistan flag. And that leads me to my absolutely favorite part of the parade. As I stood waiting for the start, a family showed up to my immediate right. Among the members were a doting dad and two cute little girls. I had flashbacks to the Greek parade. But, it turns out that the star wasn’t the little girls; it was “dad”. Being little girls (one being “the girly-girl” and the other being “the tomboy”), they were as cute as you would expect and I asked “dad” if I could take their pictures. He agreed, and even posed. The second little girl was a lot more elusive, but they did get together and they did get the attention of official photogs. For the most part, the girls just weren’t into the parade, but “dad” was. 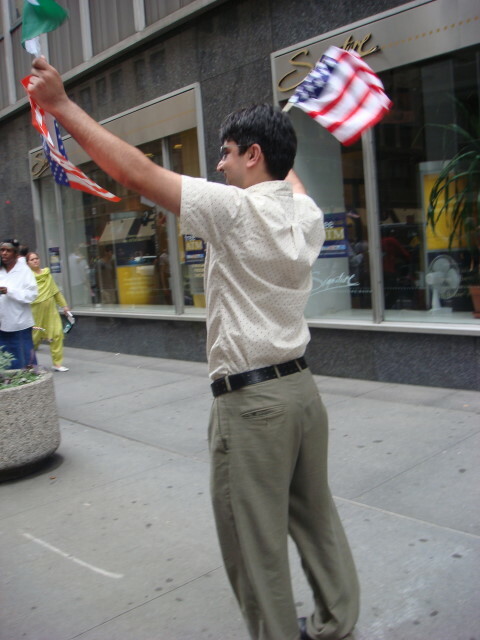 In that last picture, note that he has two American flags. That’s the interesting part. During the parade, he called to one of the people handing out placards and the like (they were inside the parade barricades). He motioned her over and started speaking and then pointed out into the street. About 25 feet away to my left was a fallen American flag, apparently dropped from one of the floats. 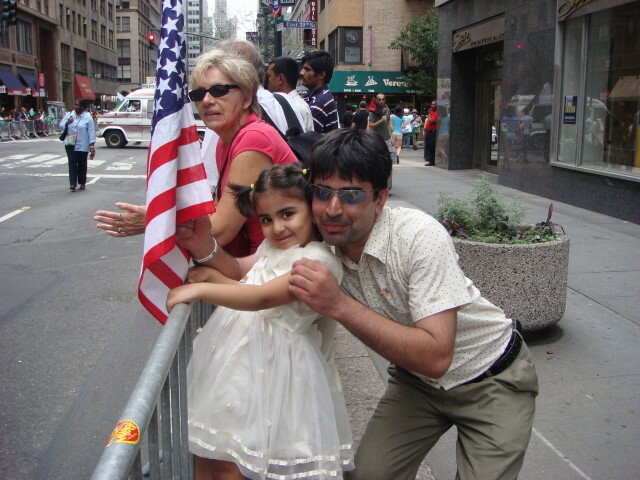 At his behest, the woman went out and picked up the flag and brought it back to “dad”. Once he had it, “dad” didn’t let go of it. “Dad” is a real American. Yeah, it’s a small thing, but it strikes me just right. The parade had started out on a quiet note. 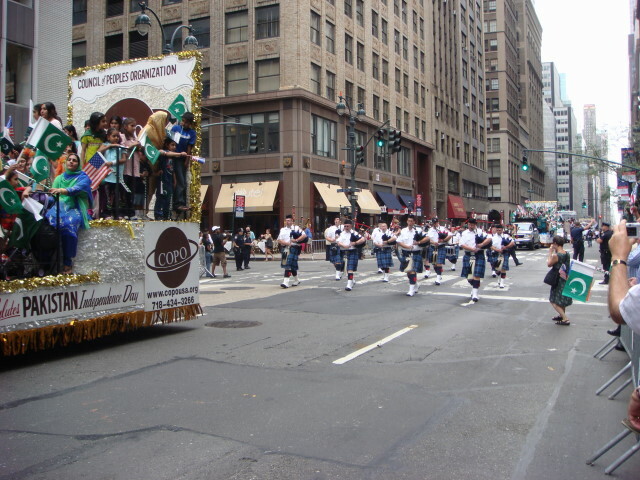 A marching band playing some Sousa and then some bagpipers. I do kinda like the slogan “Life Comes At You Fast”. It turns out to be a Nationwide Insurance Company slogan. I had no idea it was a company float as the people obscured the logo, but it turns out that there is a small “Nationwide” sign there plus the company’s other slogan. But, I didn’t see those during the march and thought the first sentence might be a homegrown/local slogan. I shoulda known. 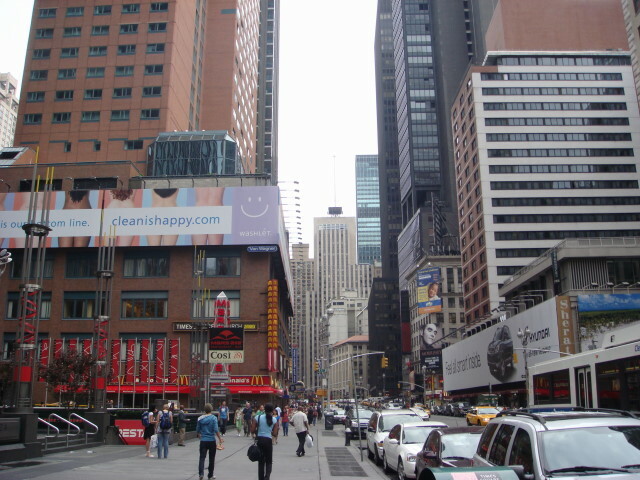 After all, I was on Madison Avenue, the home of advertising. Finally, someone cranked up the music (which had been loud, but not too loud) and the dancing started. 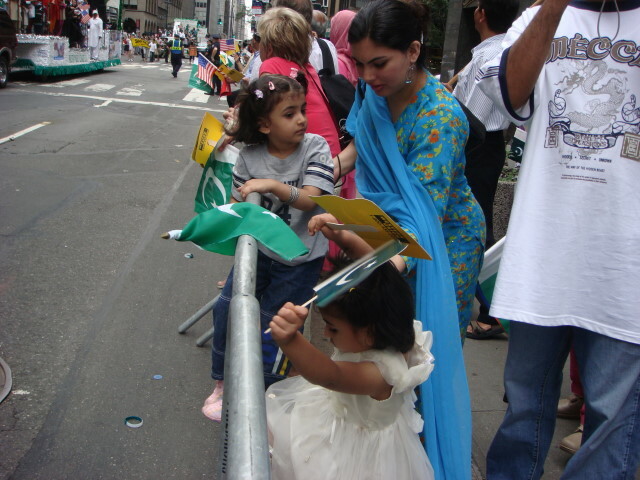 An item I learned at the parade was who Allama Muhammad Iqbal was: “the thinker of Pakistan”. Actually, he turns out to have been a poet-philosopher who pushed to have a separate Moslem country split off from India. He died in 1938, well before the independence of India from Britain and the partition of Pakistan from India. And then, it was over. The whole parade was scheduled from 1pm to 3:30pm. The actual parade lasted 18 minutes. Well, it is a minor parade. But it was pleasant. You are currently browsing the Famous Ankles weblog archives for August 2007.